One consistent fact that arises from Spectrem research is that young affluent investors are less likely to have a financial advisor than older investors. Spectrem’s most recent study shows 44 percent of investors under the age of 36 have a financial advisor. Pair that research point with a fact coming from Spectrem’s new study about insurance ownership: young investors buy insurance, and a majority of insurance products purchased outside of coverage offered from employers is purchased when investors are under the age of 36. Young investors buy insurance products. They also often do not have an advisor, who could sell them insurance if only there was a relationship established. That is the definition of opportunity knocking. Beginning with the insurance purchases, the study Investor Attitudes and Ownership of Insurance Products reveals that 33 percent of Millennial and Gen X investors own term life insurance policies beyond that provided by employers. They are also the segment most likely to own variable universal life insurance. They are less likely to purchase other types of insurance or annuities. This indicates that their thoughts on life insurance are specially targeted, and they are not yet thinking about retirement income products. The other key point from the research related to age is that 56 percent of investors who own an insurance policy beyond that purchased through their employer made that purchase between the ages of 19 and 35 (56 percent). 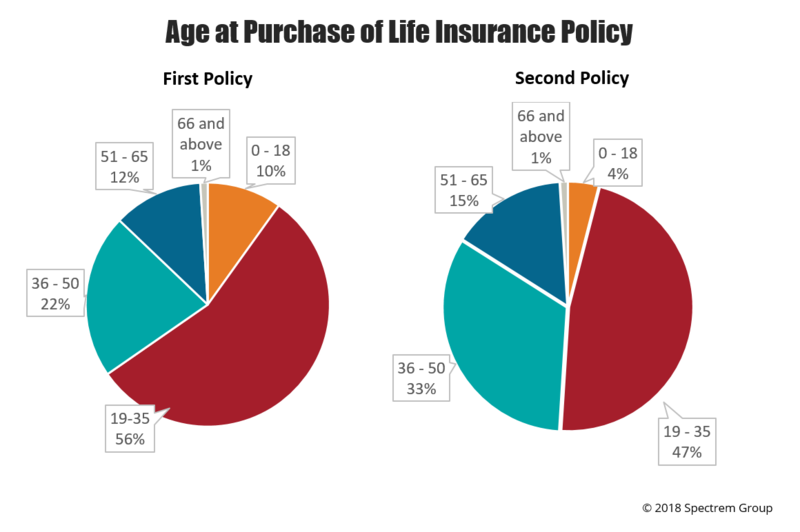 Of those who own two policies beyond their employment policy, 47 percent made that purchase before the age of 36. Somebody is selling insurance to those current and future investors. According to the study, almost half of investors get their information regarding insurance products from insurance salespeople, and one-third do their own research. Only 18 percent get information on insurance products from their advisor. But there is an expectation among investors that their advisor will provide them with life insurance advice, especially if the advisor is offering a high level of services. In Spectrem’s new study Defining Wealth Management, 82 percent of investors expect their advisor to provide life insurance advice if the advisor is a provider of wealth management. There is a greater expectation of life insurance advice than for real estate or educational budgeting advice. Investors in the mid-30s age range are also the ones most likely to incur a life event which prompts the purchase of additional life insurance, those being marriage and the birth of a child. Timing is everything, and that is true in terms of selling insurance, as well as in attracting additional investor clients. Some advisors may lean away from selling insurance products, because there is not a large financial reward for the advisor, and it is not a recurring source of revenue. But that does not preclude them from giving advice about insurance purchases, the need for insurance, and the types of insurance which would be most beneficial for a specific investor. Insurance products can be the gateway to an investment relationship with a new client. Many investment products have an insurance feel to them, including annuities, and an advisor working with a new client on insurance purchases can easily transition the conversation to the subject of retirement income products like annuities.